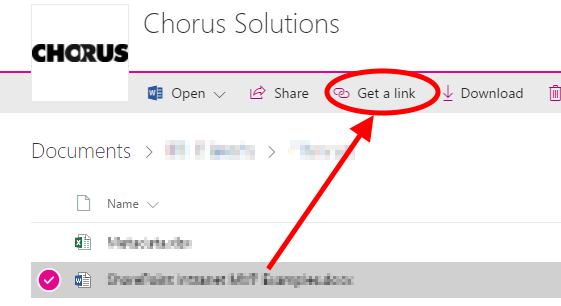 Now, when my users go to get a link, they literally get a link. They're not creating an anonymous access URL with an embedded OAuth token, they're not granting anyone access who doesn't already have access, they're literally just getting the URL for the document. Quick rant: I really don't understand the rationale behind this new default - if I'd wanted to give new people access to a document, I'd have clicked Share. Surely the most common scenario, and the most sensible default, is to leave permissions alone and just get a link. Note that you can configure these sharing settings separately for SharePoint and for OneDrive for Business (now that OneDrive has its own admin center in Office 365). This probably isn't a bad idea - in OneDrive I'm more likely to be inviting someone within the organisation who doesn't already have access, whereas in a SharePoint document library I want minimum deviation from the site permissions.